I often get questions from readers and email subscribers on how to start a travel blog and if travel blogging is worth it in 2018 and beyond. In addition to asking how to start a blog, many people ask how to grow it so they can earn money online and fund their ideal work + travel lifestyle. 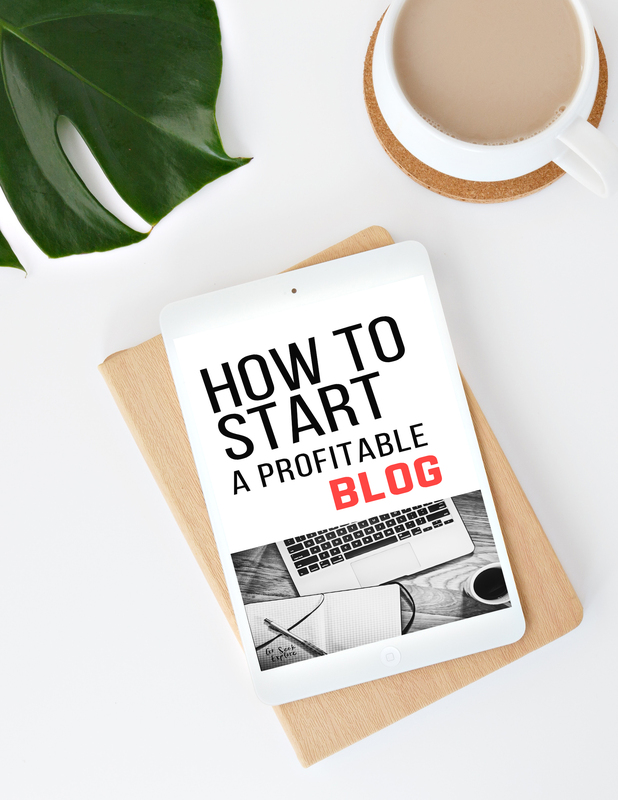 However, after writing this post, I realized that this applies to anyone who desires to start a profitable blog so they can work for themselves or have a side income and creative outlet by sharing advice and ideas on topics they are passionate about. - How to grow your blog - with an email list, social media, SEO, etc. Download this post as a FREE 45-page e-book so you can refer back to it during your blogging journey! My biggest piece of advice with travel blogging, or any type of content creation (photography, video, etc.) is that you should enjoy it enough that if you never earned money from it, you would still do it anyway. Why? Because travel blogging tends to not be very "forgiving" at the beginning. Before I cover all the "how-tos" I think it is very important to briefly cover what a blogger does to maintain their site. Okay, that was a LOT. I'll admit that you don't have to do every single thing on the list above to be a successful blogger, and you certainly don't have to do ALL of that from the start! I've been blogging for almost four years and I do all of the above, but my start was simple. I started writing blog posts - getting all those ideas out of my head, hitting "publish," and sharing them on my personal Facebook page. Then I created a Facebook page for my blog, and then made my Twitter and Pinterest more travel-focused. I pitched contributor articles to sites like Thought Catalog and was ecstatic when they chose my work and published it. Later, I created Instagram and YouTube channels and then FINALLY created an email list. With all that said, let's get going! This post is going to be packed with information, so I recommend getting relaxed and grabbing an iced coffee. Got your coffee? Okay, good! And it costs money to maintain, which you may not earn back through blogging for a bit. Travel blogging is a lot of work for little reward at the beginning so I only recommend travel blogging if you love to share your travel advice and would do it for free. The basic steps for creating a single post are: write, edit, photo editing and placement, adding links, adding a Pinterest share-worthy image, and sharing across social media networks. It varies on how long this takes. For me, it takes anywhere from 1-8 hours for a single post. But I love it! "Do I even need to start a blog?" With the abundance of opportunities with social media and leveraging platforms like Instagram for business purposes, you do not even necessarily have to have a blog to be successful in the travel blogging or influencer space. Should you start with blogging or with social media? What I recommend aspiring bloggers do is to first write out a few posts in a Word doc to see if you actually enjoy the writing part, and maybe pitch guest posts on other blogs or contributor platforms (ex: We Are Travel Girls or Thought Catalog). Since it costs money to get a self-hosted website (ex: goseekexplore.com is self-hosted whereas goseekexplore.squarespace. com would not be self-hosted), it's smart to test the waters and be sure you're ready to invest the time and money to start a blog. Another idea is to create consistent content on Instagram or YouTube since those platforms are HUGE. Some people use IG or YT as their main "hub" for their content, and focus only on building that. So that's a great idea as well! It depends on what your goals are, whether you want to use your brand/content creation to earn money or just for fun, and what type of content you like to create. If you start with social media, focus on creating consistent content centered around your niche and build it up. Assess after some time (maybe a month or two) whether you enjoy it and want to continue "blogging" on social media, if you see a benefit in creating an actual website or not, or whether you want to stop altogether. And hey, if you realize it's not for you? You've saved yourself time and money. One huge point to note is that if you have a blog, you own your website. You own your content and your email list and the only "algorithm" you need to think about is Google Search. Facebook and Instagram change their algorithms on the regular. Word around the block said that YouTube switched things up a bit too recently. Pinterest also switches up their algorithm often, and up until recently your main feed content was curated for you based almost solely on algorithm rather than the people you actually followed. A "niche" is the theme for your platform: what is your blog, Instagram account, or YouTube channel about? Unlike personal blogs for friends and family only, blogs that aim to build an audience to influence, inform, and earn an income from must help people in some way. My niche for GoSeekExplore.com is creating a "work + travel lifestyle." I help people find creative ways to travel and work abroad. It's very important that your niche is specific. Start narrow, then later you can consider expanding. You will reach more people when your niche is more focused than when your niche is wide. Example: if you search on Google or Pinterest for tips on how to go vegan, then a blog that's focused on vegan living with specific posts on how to go vegan, vegan recipes, and vegan tips is going to be much more credible to you than a blog who has a random post on being vegan, a random non-vegan recipe post, a DIY tutorial on making quilt blankets, a photo diary of their family trip to Chicago...you get the picture. When I started Go Seek Explore, my niche was just "travel." It was a good start, but not specific enough. I realized a lot of questions I was asked were about how I landed travel jobs abroad (also known as getting paid to travel), so I began tailoring my content to working abroad. I created the term "work + travel lifestyle." And you know what? I started getting more traffic, more shares, and more email subscribers when my niche was more narrow. People would stumble across my site and become a true reader, clicking through to multiple posts, sharing them on social media, and emailing me with questions about working abroad. Your "authority" will be stronger when you narrow your niche. What questions do you get asked often? Maybe that could be your niche. So you've decided you want to start a blog. Great! This section will go over the actual tech setup portion of starting a blog. In order to keep this (somewhat) brief, I won't include full tutorials but will instead link to my favorite ones that have helped me in the past. Domain: this is the website address, or URL, for your blog. The domain for this website is goseekexplore.com. Content Management System (CMS): This is the platform/app you use to write your posts in, design the look of your website, do coding, and connect any external apps. Popular ones include WordPress and Squarespace. Self-hosted: this is what it is called when you use the CMS but you own your site. You need to be self-hosted to have a "clean" domain (goseekexplore.com) versus a domain with .squarespace.com or .wordpress.com or something similar at the end. Plug-in: another word for an app or a widget that you connect your site to. An easy example of a plug-in would be an app that displays social media share buttons on your posts. Self-hosted costs money; non-self-hosted is free. Keep in mind that typically the CMS platform will NOT allow you to make money or display ads from your website unless you are self-hosted. I've always been self-hosted as I wanted a clean URL and find it more professional looking. I also like using a professional email address (hello@goseekexplore.com looks better than goseekexplore@gmail.com). Myself along with other authorities in the travel industry recommend that you get a self-hosted blog if you desire your blog to be your part or full-time job, use it as a platform, and make money from it. (If you are simply doing a diary-style blog for family and friends, it doesn’t matter). WordPress is the most popular platform in general, though I've seen Squarespace rise over the past couple of years as well. I started Go Seek Explore on WordPress in 2014 and moved to Squarespace at the beginning of 2016. There are other platforms like Wix, Weebly, or Blogger, but I'm only going to go over the other two as they are the most popular and what I personally am familiar with. In almost all cases, WordPress tends to be more affordable than Squarespace. >>> The self-hosted Squarespace platform is NOT free, but the hosting and themes are included. I've had no issues with the hosting and like how easy the themes are to customize. However, the biggest drawbacks with Squarespace are that it is notorious for being slow with SEO and some people say that is due to the host. I do like how my site looks, though - it really comes down to personal preference. You can start with Squarespace for $16/month or $144 annually. >>> The self-hosted WordPress platform is FREE, but you MUST pay for domain hosting. The top WordPress domain hosts tend to cost less than Squarespace. My opinion? I think starting on WordPress is smarter for beginner bloggers since website hosting with WordPress hosts are far more affordable. It honestly didn’t take me that long to switch over to Squarespace when I decided to. At the end of the day, you want to be sure that you enjoy blogging enough to invest both your time and money into it. It’s smart to start with a lower-cost option that has the robust backing of WordPress before deciding whether or not to switch over to Squarespace. I used to use Bluehost on WordPress. And themeforest.net is a great marketplace for finding WordPress themes under $100. You can start with Bluehost for only $3.95/month right here. Another great host for WordPress is HostGator. If you’re starting out on WordPress, I’d recommend HostGator as it is under the sister company for BlueHost and costs even less. It has great customer service and also offers free SSL certificates, which is the “s” in the https:// of your URL - the SSL is important for users to trust you and for Google rankings. First, head to the website - you’ll see the an orange button and that you can get started for only $2.75/month. Enter your domain. See? So far, so easy! Next, choose your plan - the Hatchling Plan is the most affordable. This is what I recommend for new bloggers. With my link you should see it’s actually only $2.75/month instead of the usual $3.95. You’ll then be directed to additional add-ons, which are up to you. Domain privacy is one add-on I recommend so your information (name, contact information, address) are private. If you don’t use domain privacy, your information is public and anyone can legally look it up on sites like whois. Once you’re all set up (which only should take a few minutes! ), you’re in! They will send you any remaining instructions. Again, don’t be shy if you need assistance as their customer service team is ready to help you. This is the "s" in the https:// portion of your blog and also shows that your site is secure. It's important for Google and SEO. Here's an SSL tutorial for WordPress. With HostGator, you can set up SSL for free. Here's a quick tutorial of how to do this on Squarespace. It’s also free with Squarespace. I recommend setting up SSL from the start. I didn't have it on my blog at first, and when I eventually did set it up the share counts on my social share buttons reset and I lost the previous shares - I had to upgrade to a paid version of my share buttons plug-in to get my true share count back. They both have pros and cons, but the main reason I switched to Squarespace was for its "what-you-see-is-what-you-get" design and editing. It is easier in my opinion to design on Squarespace than having to deal with some light coding and plug-ins on WordPress. There are beautiful templates that come with your hosting. I'm very design-focused and like a clean, visually-appealing aesthetic. However, a few things I miss about WordPress are its amazing SEO (as well as the free Yoast SEO plug-in)! There are some plug-ins that are not available on Squarespace. Personally I miss having the Yoast, Social Warfare, and LeadPages plug-ins for WordPress. These are very important as they allow and encourage readers to share your posts. Many share buttons also show the total number of shares that post has, which provides social proof for the post. The best way to get traffic is through free shares! Why not allow someone who enjoyed your post or found it helpful to share with their friends in a super easy way? For WordPress I highly recommend Social Warfare. For Squarespace I recommend Shareholic. (Social Warfare is not yet available for Squarespace). Google Analytics shows you how many pageviews your blog gets, how people find your blog, demographics, what social networks are referring them, and so much more. It's very important to understand that stats behind your blog. And when you see something that works...run with it! Also, if you work with brands for sponsored content (ex: a hotel review blog post in exchange for a comped stay), they will want to know what your stats are. Typically they look for pageviews, unique visitors, and demographics to start. Here's how to set up Google Analytics for: Squarespace and WordPress. PLEASE set up your email list at the beginning so you don't regret it! Even if you don't have a blog and only do Instagram or YouTube, set up an email list. Here's the thing: most people that come across your blog, probably found it either through social media, a Google search, or on Pinterest. Most people will click through, scan the post, and then click away...unless they decide to opt-in to your email list. If there is nothing there to incentivize them to come back, then why would they? How would they remember? If I tried to count how many amazing blogs I've come across over the past several years where I didn't sign up for their email list (because there was no option) and forgot about them, it would be...a lot. And if you get a blog post that goes viral? That's amazing! But if there is nothing there that allows people to opt-in for more, most of those people will forget about you. Even if you don't send out emails to your list from the start, at least collect them. You can always build your list from the start and start sending out emails later. You will need an app that collects your emails for you. You may have heard of software like ConvertKit, Mailchimp, or Aweber. There are literally dozens to choose from, but those are three of the most popular. If you receive emails from bloggers or businesses, it is very likely that they use one of those platforms to send the emails to you. I started my email list with Convertkit and haven't looked back. I LOVE Convertkit and have never had any issues or reasons to switch. You can get started with Convertkit for free here. What I liked about Convertkit when I was first starting was that I knew my list would be small at the beginning, and needed some time to work on growing my blog and developing products/affiliate strategies to earn money from it. So starting on their free trial as a newbie was great. My email list has grown significantly, but it is an investment that has paid off tenfold over the past few years. What is amazing about Convertkit is that they don't charge you extra for sending automated/"drip" email sequences. For my blog, the opt-in for my email newsletter is a free PDF guide on working abroad, with a free email series to follow. This timing of the email series goes off of when people sign up, and it automatically sends them the emails in the order they need them. This is an automated/"drip" sequence. If the email sequence wasn't automated, I'd literally have to log in every morning and see who signed up when and manually send them the email that they're supposed to get. Yeah, not realistic! That sounds horrible actually, haha. I set up this free guide + email series back in 2016 and haven't had to touch it since. Thousands of people have gone gotten these emails (the ConvertKit dashboard told me that 302,000+ emails have been sent automatically through my account - it’s insane). It's literally "set it and forget it” and I couldn’t be happier with email software. So anyways, you don't have to get all fancy or even send emails to your list right away, but I highly HIGHLY recommend getting a real email provider and putting that opt-in box up on your blog from DAY ONE. Don't make my mistake. Start your email list now, whether you're collecting emails through your blog or simply through social media. Here's the link for the free trial with Convertkit! I don't want to overwhelm you, so first I recommend setting up your blog and email list, and putting your subscribe button on your blog so you can collect emails. If it's too much for you at the start, don't get bogged down with blogging + emails + everything else. Simply collect the emails in ConvertKit or whichever platform you're using, and you can send emails later. It would be too much for this post to go into detail on what to send for your email newsletters as well as how to grow your subscribers, so I recommend bookmarking the following posts now and coming back to them when you're ready. But make sure to get that subscribe button up on your site! Okay, so your blog and everything else is set up. You've written some posts, set up social media profiles, and are ready to grow your blog. To grow your audience, you'll need to use strategies that will get eyeballs on your content (pageviews). This is referred to as "traffic." The more traffic you get, the more people are viewing your website and the more people you are reaching. Growing your traffic is important for many reasons - not only are you sharing your message with more people, but brands tend to be more likely to work with a blogger with decent/steady traffic, and if you're doing affiliate marketing (more on that next), you are likely to get more people to click on affiliate links. So how do you increase your traffic? Through using strong SEO for Google to pick up on it, and linking to your blog on your emails and social media posts. If you haven't gotten the hint yet, set up your email list! When you're ready, decide what type of content you want to send to your list and make sure to link back to your blog. An email list is one of the best ways to consistently connect with your audience. And since people signed up to receive your emails, you know they want to hear from you! I also linked some helpful posts from other people on starting and growing an email list in the previous section - bookmark those for later! I don't want to get too technical or ahead of myself in this post, but I've also started to use the Facebook Messenger bot Manychat in conjunction with my email list and like it so far. I also use a tool called Interact, which is an online quiz generator that has an option for people to enter their email address at the end. Here's a tutorial to learn more. SEO (Search Engine Optimization) is what you want to focus on when you are making your website and writing posts. SEO can be a beast to go over, so here is a helpful post that goes over SEO basics for bloggers. Once I started using Pinterest strategically as a blogger, everything changed. I grew my email subscribers significantly. I had a few posts go viral (40,000 views in a day? Yes, please and thank you!). People were emailing me saying they found my posts helpful and inspiring, and were so happy they found my blog through Pinterest. Now let's make Pinterest work for your blog! As a blogger, you want to be utilizing the power of Pinterest. First, you'll want to create a board specifically for your blog posts and have it be the first board on your profile. Next, the rest of your boards MUST be related to your niche. Make any personal boards secret (if you're a travel blogger, you don't need a paleo recipes board unless that is actually relevant to your blog). Next, optimize your bio and put your blog link (or email list subscription link) in the link section. Once your profile is more focused on your niche and consistent with your blog, then create "cover images" for your blog posts. Basically these are the vertical images with text on top that are eye-catching and easily shareable. I recommend doing these for your most popular 2-3 blog posts if you're getting started, and making a pin for each blog post from now on. Use Canva (free!) or Photoshop ($10/month) to create the cover images for your blog posts. If you're new to making graphics, I recommend using Canva as it is free and super easy to use. You can use Canva to whip up an image in 10 minutes or less. While I love Canva, if you're looking for something more advanced, I'd recommend Photoshop - my preferred tool. Plus, I love that for $10/month you also get Lightroom, which I use to edit my Instagram photos. Pinterest can get a little time-consuming, but it is definitely worth it for growing your traffic. Pin regularly - and automate your pins if you'd like. It's recommended to pin 10+ pins per day to stay on top of the algorithm (you can schedule your pins with an app called Tailwind) and also joining and pinning to group boards. A great website to find group boards is pingroupie.com. You can also look up the Pinterest accounts of your favorite bloggers in your niche and see what group boards they are part of. Feel free to check out my Pinterest profile as I have over 20 travel group boards on there. Work on pinning regularly and find relevant group boards to pin to. Once you've covered the basics, consider investing in a scheduling tool like Tailwind or using Photoshop to design your pins. Instagram really should be its own blog post since it is HUGE, especially right now. Facebook is a beast in its own right, especially if you're using Facebook advertising or focusing on video. Twitter is still hanging in there, along with Snapchat. YouTube is an incredible platform for sharing videos and building an audience. Pinterest is...not a social network - it's more of a visual search engine. But still very important for traffic. Okay, next I'm sure you're ready to learn how to make money from your blog. Since many people who come to my site want to use a blog to support an online income as part of their work + travel lifestyle, here are some of my best tips. Once you build up your blog and get a following (usually with traffic, email subscribers, social media), then you can get to the point where you can use your blog as a platform and make money in various ways. If you're new to blogging, I recommend starting with affiliate marketing. Affiliate marketing is when you link to a product or service as an affiliate, and you earn a commission of the purchase as a referral. You could also have a unique discount code someone can use at checkout. You're probably familiar with this on Instagram. For example, Daniel Wellington is a popular fashion brand for watches, and you'll see people promoting their discount code (and if someone purchases with their code, DW will give them a percentage of that commission). A real life example would be going to a hair salon and referring your friend to the salon, and then the salon gives you a discount on your next visit. Affiliate marketing is one of the simplest ways to earn money blogging and is passive income. I wouldn't say it is easy necessarily, because you need strong, targeted traffic, and people need to purchase the item you're promoting for you to earn a small commission. Some affiliate programs require you to earn $100 minimum in commission before they do a payout. However, it can be quite lucrative if you build this up! Note that the Federal Trade Commission requires that you disclose to your readers when you endorse a product or service and have a “material connection” to the seller. See the disclaimer I used at the end of this post for an example. Working with brands is probably the most common form of monetization people seek when they begin blogging. They see bloggers, YouTubers, and Instagram-ers earn free products, hotel stays, trips, clothes, etc. in exchange for promotion on their platforms. Depending on the partnership, the blogger may even be paid on top of the free product or service. As a travel blogger, it is very common to seek and be sought out for partnerships with businesses in the travel industry. Think hotel stays, tourism boards, fashion brands, etc. However, as the space is getting more crowded, 1) don't let that discourage you, but 2) know that you need to have a credible, strong brand. It doesn't always matter how long you've been blogging for, but it does matter in terms of consistency and how targeted/engaged your audience is. Know that this requires a lot of work on your part. You MUST deliver and follow through on your partnership with the brand. If you say you will write a blog post review in exchange for a free product by a certain date, write the post and complete it on time. Also, with any type sponsored content, the FTC requires you to disclaim that as well. (If this is on a social media post, you will usually see #ad, #sponsored, #sp, or "Paid partnership with [company]." Sidewalker Daily is a great resource for travel bloggers/influencers. You can also use your platform to sell physical or digital products related to your niche. This is another great way to diversify your income while creating products you love that will benefit your audience. I sell both physical products and digital products, which I started doing about two years into blogging. You don't have to wait, though! I just was oblivious to all of this back when I started, haha. Freelance work is very common for people on all ends of the blogging spectrum, because you likely have skills and can help with projects that other people would pay for! One of my main sources of income is freelance work. Personally, I do online marketing (Pinterest management & SEO, email marketing, social media management, project management, etc.) for my clients. You don't have to use your blog for your freelance work, but for me, it was the example I used for potential clients to check out and see that I walked my talk when it came to online marketing, since I use all the strategies listed above for my blog. You can freelance pretty much any task, and if you do so online, you can work + travel from anywhere. Freelance work could include photography, copy writing, copy editing, graphic design, website coding, and so much more. Check out sites like Fiverr or Upwork for ideas and consider creating profiles on there to attract clients. Some people who are more established may offer online coaching on their blog topic, so that is something to consider too. Just know that it's always important to diversify your income streams. When you're just getting started, you don't necessarily need to think about the income from blogging, but definitely keep it in mind and set goals for what you want to build from your blog. If you're not entirely sure you want to start a blog, consider starting on social media first to see if you actually like it. However, if you’re serious about making this your profession, having an actual website can definitely increase your credibility and visibility. Set up your email list :) whether or not you have a blog, make sure you have an email list, even if you’re simply collecting emails at first. Choose your blog provider and set up the essentials. Give yourself plenty of time to do this! While setting up the hosting takes only a few minutes, I recommend blocking off a chunk of your weekend or a full day to do the actual tech setup with your design and writing the initial content. Create a few posts and outline more blog post or content ideas to keep you on track. Use Pinterest, social media, and your email list to drive traffic to your blog. Consider incorporating income strategies into your blog or platform when you’re ready. If you've read this far, thank you! I hope you found this valuable, insightful, and use this as a blueprint for starting, growing, and earning income from your travel blog. Wishing you the best of luck with your blog! There are some affiliate links in this post which earn me a small commission at no additional cost to you.